Brazil’s Democracy to Suffer Grievous Blow Today as Unelectable, Corrupt Neoliberal is Installed – Desinformação Não! Para a posteridade: Dizem que não é um golpe, mas, a pessoa que assumirá a presidência é inelegível! Glenn Greenwald no site The Intercept faz o que a imprensa brasileira esconde. Mostra o golpe! In 2002, Brazil’s left-of-center Workers Party (PT) ascended to the presidency when Lula da Silva won in a landslide over the candidate of the center-right party PSDB (throughout 2002, “markets” were indignant at the mere prospect of PT’s victory). The PT remained in power when Lula, in 2006, was re-elected in another landslide against a different PSDB candidate. 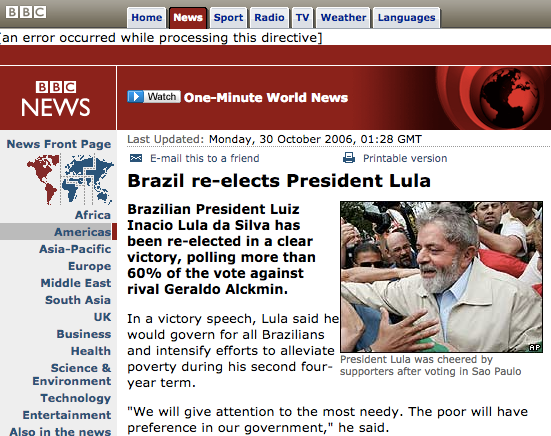 PT’s enemies thought they had their chance to get rid of PT in 2010, when Lula was barred by term limits from running again, but their hopes were crushed when Lula’s handpicked successor, the previously unknown Dilma Rousseff, won by 12 points over the same PSDB candidate who lost to Lula in 2002. In 2014, PT’s enemies poured huge amounts of money and resources into defeating her, believing she was vulnerable and that they had finally found a star PSDB candidate, but they lost again, this time narrowly, as Dilma was re-elected with 54 million votes. In sum, PT has won four straight national elections – the last one occurring just 18 months ago. Its opponents have vigorously tried – and failed – to defeat them at the ballot box, largely due to PT’s support among Brazil’s poor and working classes. So if you’re a plutocrat with ownership of the nation’s largest and most influential media outlets, what do you do? You dispense with democracy altogether – after all, it keeps empowering candidates and policies you dislike – by exploiting your media outlets to incite unrest and then install a candidate who could never get elected on his own, yet will faithfully serve your political agenda and ideology. That’s exactly what Brazil is going to do today. The Brazilian Senate will vote later today to agree to a trial on the lower House’s impeachment charges, which will automatically result in Dilma’s suspension from the presidency pending the end of the trial. Her successor will be Vice President Michel Temer of the PMDB party (pictured, above). So unlike impeachment in most other countries with a presidential system, impeachment here will empower a person from a different party than that of the elected President. In this particular case, the person to be installed is awash in corruption: accused by informants of involvement in an illegal ethanol-purchasing scheme, he was just found guilty of, and fined for, election spending violations and faces an 8-year-ban on running for any office. He’s deeply unpopular: only 2% would support him for President and almost 60% want him impeached (the same number that favors Dilma’s impeachment). But he will faithfully serve the interests of Brazil’s richest: he’s planning to appoint Goldman, Sachs and IMF officials to run the economy and otherwise install a totally unrepresentative, neoliberal team (composed in part of the same party – PSDB – that has lost 4 straight elections to the PT). None of this is a defense of PT. That party – as even Lula acknowledged to me in my interview of him – is filled with serious corruption. Dilma, in many critical ways, has been a failed president, and is deeply unpopular. They have often aligned with and served the country’s elite at the expense of their base of poor supporters. The country is suffering economically and in almost every other way. The biggest scam of all is that Brazilian media elites are justifying all of this in the name of “corruption” and “democracy.” How can anyone who is minimally rational believe this is about “corruption” when they’re about to install as President someone far more implicated in corruption than the person they’re removing, and when the factions to be empowered are corrupt beyond what can be described? And if they were really concerned with “democracy,” why wouldn’t they also impeach Temer and hold new elections, letting voters decide who should replace Dilma? The answer is obvious: new elections would almost certainly result in a victory for Lula or other candidates they dislike, so what they fear most is letting the Brazilian population decide who will govern them. That is the very definition of the destruction of democracy. As someone who has lived in Brazil for 11 years, it’s been inspiring and invigorating to watch a country of 200 million people throw off the shackles of a 21-year-old right-wing (US/UK supported) military dictatorship and mature into a young, vibrant democracy and then thrive under it. To see how quickly and easily that can be reversed – abolished in all but name only – is both sad and frightening to watch. It’s also an important lesson for anyone, in countries all over the world, who blithely assume that things will continue as is or that they’re guaranteed stability and ongoing progress.